Build a team on potential and bad things can (and often do) happen. Not saying the Bulls were, just saying that word has destroyed many a franchise in sports across the board. The odds of Butler taking off with a team built around him are far better than the odds of sticking with Rose as your centerpiece. I hope Rose is ok physically. It may be harder for him to comeback from this mentally more so than anything. Serious hes entering that Andrew Bynum, Penny Hardaway, Brandon Roy, Tracy McGrady territory. Where he may be able to come back, finish out his contract but then be a mere role player in a supportive fashion elsewhere. Sad but thats looking more and more like his destiny. Sad, so sad. This team could've went down in history as a great team if they weren't always battling injuries. Some of this is on Thibodeau, running these guys at 110% during the regular season, when it really doesn't matter. This is yet another reason why Popvich is a coaching genius. Phil was also fantastic at managing player minutes. It really is a strange situation with the Bulls. Going into this season they looked like a lock to come out of the west with the quality of players they had, but they just haven't been able to figure it out and then they lose Rose and Butler. And Gibson too, which shouldn't be ignored. Honestly, i think they have the potential to win it all - even with their recent struggles - but i could also see them imploding and getting bounced in the first round. Going forward, i have no idea how this team looks either. They could be the exact same team next season OR they could have a completely different lineup. Derrick Rose participated in non-contact portions of the Chicago Bulls' practice on Tuesday. Tom Thibodeau said Rose is "maybe even slightly ahead" of his four to six week timeline that began on Feb. 27 when he had knee surgery. 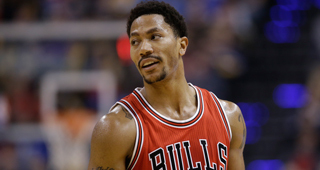 The Bulls expected Rose to return this season when he underwent his surgery. I still think the Bulls have the pieces to win it all - but they better figure out how to play together pretty soon or else they could be a first round exit. Luckily, their probable opponent (Wizards) is also in a bit of a funk. Chicago's best case scenario is that he comes back and can play a role on the team. You look to deal him and move on. If you don't get deals you like then you move on anyway, building a team not centered around him. Rose then becomes a second or third opton. Hard pill to swallow, but if the Bulls don't want to wait another decade for relevance, they'd better think about it long and hard. Would you take him (Rose) on the Lakers? His best days are behind him, but I would imagine him and his agent would still demand top flight money to cash in while he's still on his feet. That ship has sailed, let someone else buy into it. It would be nothing but Steve Nash 2.0. 2012 Lakers with D'Antoni at the helm, fully healthy would've not gone down as a great team. That was doomed upon that hiring. Do have a question I did want to ask. What do you think Byron would have done if he was given that team instead? And he wouldn't have chased Pau and (more than likely) Dwight away either.